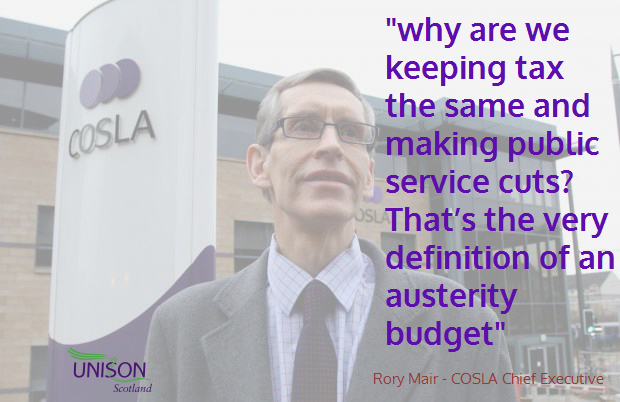 In tomorrow’s Scottish budget debate, if they are serious about opposing austerity, MSPs need to do more than badly administer George Osborne’s efforts to wreck our public services. The Scottish Parliament will debate the Budget Bill on Wednesday. The big loser in that budget is local community services with a cash cut of 3.5% or £350m in 2016-17 - that's 5.2% or £500m in real terms. On top of that there are additional commitments like the NI increases that could double the cuts. As well as the loss of valued local services, there could be as many as 15,000 job losses, with the consequential impact on the local economy. 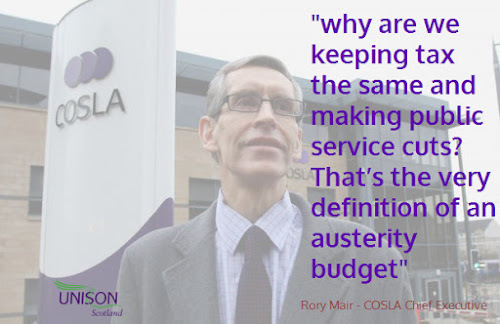 This has inevitably resulted in a fraught discussion between CoSLA and the Scottish Government over the grant allocation. Not helped by John Swinney’s draconian penalties for any council daring to consider an increase in the Council Tax. CoSLA voted to reject the package last Friday, a position supported by those authorities not in CoSLA. The one positive element from the budget discussions is an allocation from the £250m identified for social care, to pay the Scottish Living Wage to care workers. There still needs to be clarity over how this money is allocated, but this would make a significant contribution towards the staffing crisis in Scotland’s social care provision. Today, Scottish Labour leader Kezia Dugdale took a bold move to break away from austerity economics. She proposes increasing the Scottish Rate of Income Tax (SRIT) by 1p. This will raise around £480m, less a £50m rebate to ensure that low paid workers under £20,000 per year don’t lose out. The reluctance to use the SRIT is in part because of our criticism of the Calman report on these powers. We have allowed a narrative to develop that, because we can’t have different rates or change the income tax bands, any use of these powers is not progressive. I confess that I have been one of those who has allowed my criticism of Calman to allow this narrative to develop. The Calman tax powers are certainly flawed, but that doesn’t mean they are not progressive. 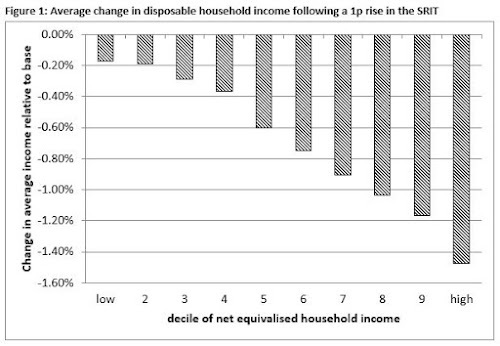 As David Eiser from Stirling University explains, "the poorest fifth of Scottish households would experience a fall in net income of slightly less than 0.2%, whereas the richest fifth of households would experience income falls greater than 1%. So a rise in the SRIT is slightly progressive". And of course Labour’s plan means that low income earners are protected, making it even more progressive. In addition, the Calman restrictions on bands and rates will end when the Smith Commission powers are implemented, probably in 2017. There is growing evidence that people understand that if we are going to avoid these cuts, and protect the things we value, the money has to come from somewhere. Previous proposals to increase income tax have been in very different circumstances. Scotland now has a real opportunity to break away from austerity. I hope the Scottish Government will take this opportunity to build a cross party consensus that stops the savage cuts to the services which vulnerable people rely on. That's what being an anti-austerity party really means.